Successfully Added 4 Inch Waterproof Smartphone - Octa Core CPU, 2GB RAM, 16GM Memory, Mali GPU, IP67 Dual 4G SIM (Yellow) to your Shopping Cart. The perfect phone for those with a demanding job or lifestyle that where they are constantly exposed to the hazards of an outdoor environment. Live an extreme lifestyle or work in challenging conditions, they you'd better have a phone that can cope with water, dust and drops. The F210 can do just that with its IP67 protection. Tested to withstand submersion in water and impervious to dust this rugged Smartphone can roll with the punishment of extreme conditions and has your back in the great outdoors. The bright 4 inch display is big enough for all your phone needs so you can enjoy games, viewing movies and browsing the web while still having a phone that fits comfortably in your pocket. With dual SIM card slots both supporting 4G connectivity you have a great choice for work and personal use as well as for traveling. Accessing the 4G network will being incredible download speeds comparable to your home broadband allowing you to steam HD content direct to the phone. A fast octa core CPU 2GB of RAM and a Mali GPU bring a zippy performance and with its Android OS the F210 rugged phone can handle all your phone needs as well as offer plenty of gaming and multitasking support. Utilizing a 3000mAh battery brings the phone over 4 hours of talk time and in standby it can last several days on end so you're covered for those long weekends away or busy days making calls. with 16GB of internal storage you have plenty of space for your media library and can top up with apps galore from the play store, but don't worry if you overdo it as with a micro SD card you can add an extra 32GB of storage. 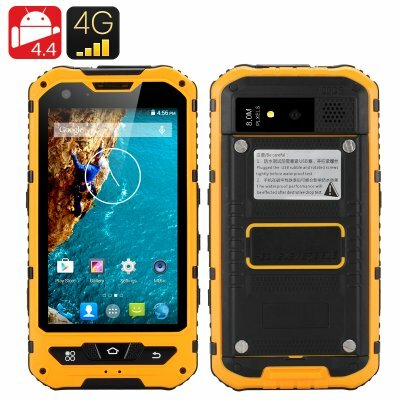 The F210 IP67 Waterproof Rugged Smartphone comes with a 12 months warranty, brought to you by the leader in electronic devices as well as wholesale Android Phones..